I got Bonnie in March of 2009 with her two siblings Prince and Claudia. Bonnie was my calm, sweet and happy little girl. 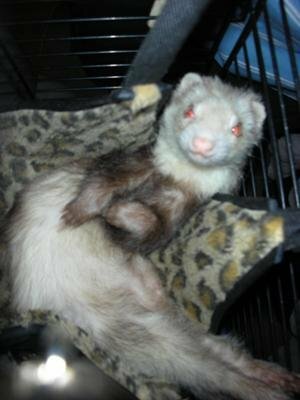 Out of the three ferrets, she preferred to be a loner often finding areas in the house that was quit, hidden, and cozy. In July of 2010 I started to notice she was staring into space often and her eating habit changed. I took her into the vet and was told that she might have the beginning signs of adrenal disease but after a adrenal panel test came back negative I was told her diet might need more protein and that could have made her tired. All was good until November, I noticed during play time she would go back to her cage or find a place to sleep right a way without exploring like she normally did and the top of her head was balding. I took her to a second vet who noticed a hard large mass next to her liver. After a ultrasound it was discovered that she had 5 mass tumors caused by pancreatic cancer that caused insulinoma. Due to her health at the time and the the locations of the tumors that surgery most likely would not help. She was put on ped and told by the vet to make her happy and conferrable and she would have only 3months at max. Baby girl looked to be doing okay other then her lack of energy and light weight until the morning of January 17th, I noticed she was dragging her back legs and was having trouble using the bathroom. On the 18th she was not eating or responding to my voice when saying her name, when awake she was only lethargic. Bonnie at the age of 3 passed on January 18, 2011 at 11:33pm at my vets office who always has a doctor there 24hrs, That night I felt that she was telling me she was ready. She passed in my arms with her little blue blanket while giving her kisses and telling her I loved her. I miss her everyday and her loss made a big hole in my heart, but my other two fuzzies are helping that void everyday. My little one passed recently... a combination of insulinoma, that we fought and kept under control for a while... and then the devastating complement of adrenal cancer taking over... I regret not having been more stern at the vet and impose holding her in my arms when the moment came...live and learn... but she was talked to, caressed and kissed until she found peace.